Open your imagination and create – pure and simple, this is how Dawn Papineau inspires her students. Kindergarteners are introduced to “Miss Betty,” their paintbrush, and are shown techniques to take care of “her” so their artwork will always be the best it can be. 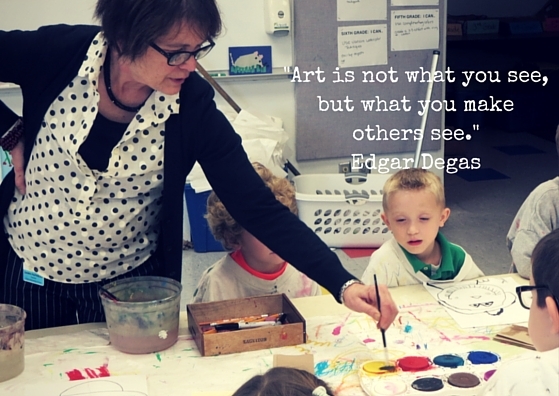 As she walks around the room helping each student she makes it clear that “no two pieces of artwork should be the same, and that’s exactly how we like it.” Students truly have the opportunity to express themselves through art. This year we can share our student’s artwork with friends and family through Artsonia, an online museum, where we can purchase formal prints and products adorned with our student’s artwork!